Huayllipacha (pronounced: Why-Lee-Pacha) was conceived in 1987 by several Peruvian youths from the Andes. As a tribute to their culture, and with respect, honor and admiration of their Ancestors, these talented and dedicated musicians named the group using the ancient language of Inca-Quechua. "Huaylli" means "song of triumph", and "Pacha" means "the earth". To simplify, "Singing to the Earth". Along their collective journeys, and accompanied by many dreams and illusions, several members of the group found their way to Europe and the U.S.A. Shortly after the group settled in the U.S.A., Huayllipacha experienced a loss of valor in the death of a founder of their group, Hugo Felix Montoya. It was this profound loss that spawned the rebirth and rededication of Huayllipacha by the remaining musicians, establishing themselves in Northern California in 1994. At first, it was a duo of the two brothers, Fredy and Moises Salazar-Quispe. 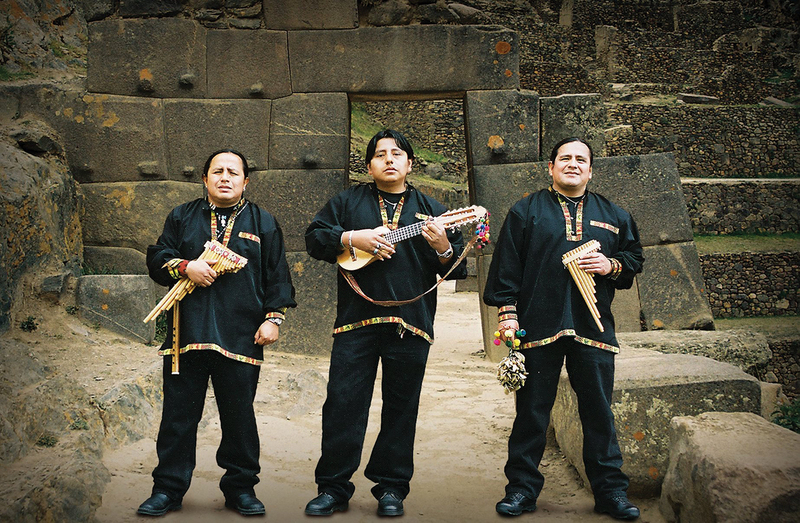 In 1998, as they traveled and performed all over the U.S., they were joined by two more family members, brothers David and Juan Salazar-Quispe, who had been performing all over their native country of Peru. The combined musical talent of these brothers, and the love for their music, brings to the listener, a dynamic and enchanting experience. The proposal of Huayllipacha is to form a band that maintains the traditional Andean Music. We try to spread the Andean musical art in honor of our ancestors and never allow it to perish for the love that we have for the South American indigenous culture. We also believe that music evolves in time like many other things in the human nature; therefore, we try to understand this artistic changes and evolve with it. Thus, we are allowing ourselves to be part of the new contemporary Andean music that South America has been acquiring. As the group evolves, we expand our styles, honoring both traditional and contemporary music of the Andes, as well as from other regions in South America. Embracing all these styles, the music of Huayllipacha will always come from our heart and soul, to share it with the people of the Earth.